← Chicken Diane – What a delicious surprise! I’ve made this appetizer for years. It is a favorite of my friend Kelly. We recently had family and friends visiting to celebrate my Moms 80th birthday and I served this because it’s easy and delicious. 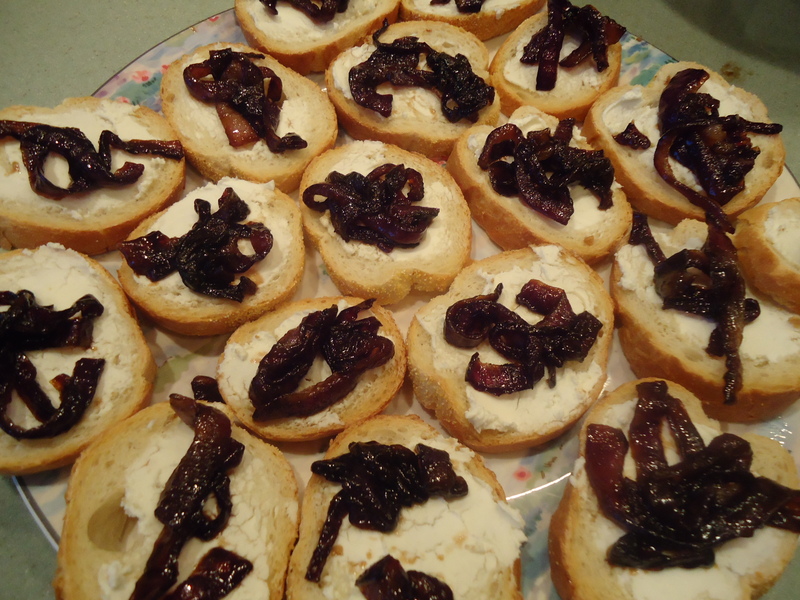 The goat cheese offers a bit of a bite while the caramelized onions pop with flavor from balsamic vinegar and brown sugar. Do a bit of prep work in advance by slicing the loaf of French bread ahead of time. Keep it in a zip lock bag. Don’t do this too early though, a day at the most. In a medium skillet over medium heat, saute onions in the olive oil for 15 to 20 minutes or until light brown. Add the brown sugar. Saute for 3 minutes. Add the vinegar and saute 1 minute longer. Arrange the bread slices on a baking sheet. Toast lightly in the oven. Spread the cheese on the bread and top each with some of the onion mixture. This entry was posted in Appetizers, Company Worthy. Bookmark the permalink.